Nancy Y. Gorman - Gonser and Gonser, P.A. 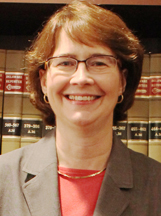 Ms. Gorman practices primarily in the areas of Estate Planning and Elder Law. A member of the Estate Planning Council of Delaware, Ms. Gorman prepares Wills and Trusts (including Special Needs Trusts), Durable Powers of Attorney, and Advance Health Care Directives, as well as assisting clients with probate and estate administration matters. Ms. Gorman assists clients with adult guardianship proceedings, Medicaid planning (including Miller Trusts), and nursing home issues. In addition, Ms. Gorman is on the Board of Directors for Delaware Elder Mediation Services, Inc., and is a trained mediator. Ms. Gorman also has experience with preparing Pre-Nuptial Agreements and representing clients with respect to the purchase and refinance of residential real estate.